In computer networking a routing table is a data table stored in a router or a networked device that lists the routes to particular network destinations, and in some cases, metrics (distances) associated with those routes. Static routes are entries made in a routing table by non-automatic means and which are fixed rather than being the result of some network topology “discovery” procedure. Static route on MyPBX is used to configure to route the connection, packets to particular network destinations, usually a specific gateway. 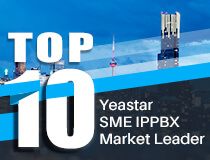 In some countries, the SIP provider could provide SIP service by providing users a gateway and require the MyPBX to connect to the gateway directly. The problem is that the gateway is for SIP only but no other internet application. At this time, if users would like to synchronize time from NTP server, send voicemail to email or using remote extensions for example, it would be difficult without configuring static route. At this moment, we can connect the LAN port to the SIP gateway provided by the SIP provider and the WAN port to the internet.